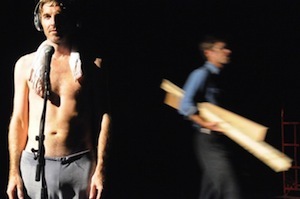 Inspired by Fyodor Dostoyevsy’s The Brothers Karamazov the show gives us two men engaged in both mundane and extraordinary acts – it opens with the younger one shaving the shirtless older man with a straight razor. They rehearse a bit of monologue, prepare dinner, bicker, discuss travel plans, and the older of the two delivers a thirteen-minute lyrical but disjointed monologue about, um, well. Freedom, I think, and responsibility, but as one analogy blended into the next I lost track a bit. It was admittedly not my favourite part, and I zoned out for a minute there, watching the play of light on skin. The words, mostly, did not work for me. It felt stilted and strange when juxtaposed against the handsome, seamless motion both men were engaged with. The problem was compounded by some less-than-stellar elocution, and a certain amount of incidental noise. For the first fifteen minutes of the show no one said anything, except to rehearse an audiotaped monologue into a microphone, and I started to expect a dialogueless show. I wish I’d gotten it. But oh, the dance. I admit that I deeply enjoy dance that feels masculine and fluid, and this was all that and more. Acrobatic, inventive, energetic and supremely graceful, when the movement parts of the show clicked into motion I was riveted. Elements of mime, fragments I’ve seen in figure skating choreography, contact improvisation and more got mixed together into a series of dance duets that never felt disjointed, for all that they were eclectic. Besides which, even the movement pieces that were not “dance” in any formal sense – the straight-razor shave, building a long table out of planks and sawhorses, gutting fish, chopping onions, moving chairs – were marvelous. In the same way that even a great musician’s idle whistling is a mile better than a layman’s, these performers drove screws and tossed chairs with astonishing focus and verve. In the end, their fluidity, even when doing things like pouring water over a colander of gutted fish, was what sold me on this show. Music choices, likewise eclectic, really worked, as did the convention of having the characters summon each song from a laptop in the natural way you might play a song for a friend to hear. And although I have heard Nina Simone’s “Sinnerman” approximately one zillion times in theatrical settings as the official anthem of A Change In The Action, it didn’t feel clichéd here. A lovely surprise. If I were James McKee, the director of this show, I would let the performers say a lot less and do a lot more. As it was, there was plenty to see, but I would have been a great deal happier with the overall show if I’d gotten to hear a lot less. Brothers plays at Factory Theatre, 125 Bathurst St.